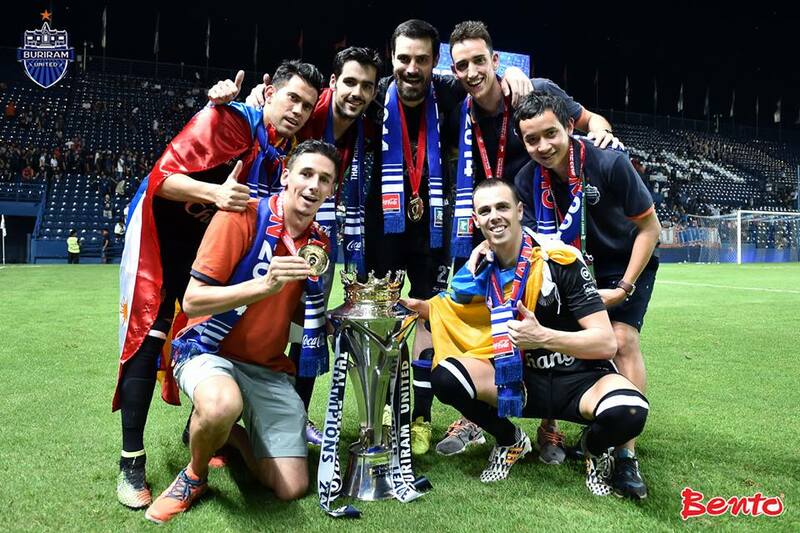 On Sunday 2 November 2014, as many leagues in Europe were just gaining momentum, the Premier League chase was finally settled in Thailand as Buriram United retained their crown following a 2-1 victory over Police United. Although in hindsight the failure of nearest rival Chonburi to beat TOT SC rendered this result irrelevant, over 25,000 fans at the New I-Mobile Stadium – or, as the locals prefer, Thunder Castle – rapturously received the symbolically significant goals scored by erstwhile Sporting Gijón forward Carmelo González and Deportivo La Coruña youth graduate David Rochela. Imports such as these, as well as Spanish-Filipino top-scorer Javier Patiño, have helped this ambitious club enjoy the most successful period in its history (it has existed in several guises since 1970), with all four of its league titles coming in the past seven seasons. Not all overseas acquisitions can be said to have provided the club with value-for-money, however, with former Arsenal and Hull City forward Jay Simpson serving as a recent warning against excess. He had been lured to the club in 2013 on a reportedly record-breaking contract yet returned to England this summer after less than a year into his Thai adventure to play for Leyton Orient. However, one man who, with fewer than five months’ worth of appearances to his name, has left an indelible mark on the club and who could surely leave tomorrow and still be regarded with affection for years to come, is another of Buriram’s recruits from Spain: Venezuela international and former Celta Vigo centre-back, Andrés Túñez. Túñez was born in Caracas to Galician parents who returned, with seven-year-old son in tow, to Spain’s notoriously rain-sodden north-west region where in his teenage years he signed forms with one of the two most revered local clubs, Celta Vigo. It was a relationship that would last over ten years, with Túñez first appearing for the B team primarily in his favoured position on the left side of a centre-back pairing in the 2006/07 season and eventually getting his chance with the seniors in the first half of the 2009/10 campaign at the age of 22. He rose to prominence in a side that, despite languishing in mid-table of the Segunda División, reached the Quarter-finals of the Copa Del Rey – equalling their joint-best performance since they were runners-up to Real Zaragoza in 2000/01 – and was rewarded with a four-year contract. Despite playing in the majority of the remaining league games that season, his career took a temporary step backwards the following campaign, as with the arrival of new manager Paco Herrera in the summer, he featured in fewer than one-fifth of his side’s matches. However, the 2011/12 season was to prove pivotal, bringing immense personal and professional pride, as not only did Túñez make his international debut for the country of his birth against Argentina, but he was also the beneficiary of a change of heart on the part of Herrera and became a first-team regular in what was to be a promotion-winning year. Moving up to the Primera División brought with it the concomitant higher quality of opponents but while Celta struggled in terms of results, when not sidelined by injury or suspension Túñez was an ever-present in the team. One game in particular that stands out from this season again came in the Copa Del Rey when a Real Madrid side that started with, amongst others, Ronaldo, Di María, Benzema, Alonso and Modrić (not to mention Callejón, Özil and Kaká all coming off the bench) were defeated 2-1, though Los Merengues were to progress following a 4-0 hiding in the return leg. Alas, this season was more about the battle to survive, a cause Túñez felt viscerally as he stated in early May 2013 that if Celta lost two vital upcoming games against Atlético Madrid and Real Betis then ‘the whole season goes to hell’. His side were indeed defeated in both matches leaving them four points adrift yet no apocalypse came as, remarkably, Celta were ultimately successful in preserving their top-flight status via wins in the final two matches against Real Valladolid and Espanyol. Then along came Luis Enrique. Barely a week after Túñez fell to the ground upon hearing the final whistle and was mauled by similarly relieved fans on the dramatic last day, Lucho was installed as the new manager, replacing Abel Resino who had, in turn, taken over from Paco Herrera in February. The Barcelona legend brought in several players of his own and while initially optimistic, Túñez soon came to realise that he was not going to be part of this bold new era. Though he could not have known it at the time, the emotional victory over Espanyol was to be his final competitive game in the colours of Os Celestes. Subsequently, partly to bolster his chances of helping Venezuela’s attempt to qualify for World Cup 2014, the man who had spent all of his career playing in the region of his youth exhibited some symptoms of a spurned lover as he looked to move far away, eventually agreeing to join Israeli side Beitar Jerusalem on loan in September 2013. While Túñez has said that he enjoyed this sojourn, it did end in professional disappointment as Beitar finished 9th out of 14 teams in the regular season and thus suffered the indignity of playing in the play-offs contested by the bottom eight sides. Túñez, however, had left in March just before the play-offs had begun and at the end of the following month he terminated his contract with Celta (two years before it expired), instead embarking on a fresh challenge with the reigning Thai champions Buriram United. This was certainly not a conventional move for a player with experience of arguably the best league in the world and who, at 27, was entering the prime of his career. However, due to the number of players with Spanish links associated with the club it was perhaps less of a venture into the unknown than may be assumed, never mind a downward spiral into a footballing abyss. Indeed, not only was he greeted at the club by the considerable talents of Javier Patiño and Carmelo González (who now have over 70 league goals between them for the past two seasons), as well as defender David Rochela, but amongst the backroom staff he would have found the Strength and Conditioning Coach/Performance Analyst, Arnau Navarro. Túñez has stated in an interview with Los Otros 18 that he sought the advice of Navarro and others before moving, though there was one man he narrowly missed upon his arrival with whom he could have shared a Balaídos story or two. Alejandro Menéndez, who coached Túñez between 2007-09 in Celta Vigo’s B side, was relieved of his duties as Buriram manager two weeks prior to the signing of the Venezuela international. Despite having won virtually every conceivable domestic honour in 2013, Menéndez was the victim of an insatiable drive for instant success as Buriram’s woeful start to the 2014 campaign saw them take just 10 points from 8 games, leaving them 12th in the league and virtually out of the AFC Champions League at the group stage. Consequently, the Serbian Božidar Bandović was brought in on an interim basis until early June and he had much joy revitalising the squad as they gained 20 of the 27 available points in the nine league games that he managed. Túñez took no part in this early stage of the club’s revival as he was acclimatising to his new surroundings, though in his debut on 11 June in the very next game – the first overseen by the new Brazilian manager Alexandre Gama – an event occurred that was to have an unforeseen effect on his season. What for his team-mates was a routine 3-1 away win in the Toyota League Cup against second-tier TTM Customs was curtailed abruptly for Túñez after he received a sharp elbow to the nose, breaking it and obliging him to wear a protective mask for the next two months. As shall be related, what was intended as a mere functional – if somewhat stylised – rehabilitation aid allowing him to play, was to become the defining identifying feature of a player who, when he did return to action two weeks later, rapidly ingratiated himself with the Buriram fans with some outstanding, match-winning displays. Indeed, with his side now 3rd he made his first league start on 25 June away to Songkhla United, playing a crucial role in the outcome. With 15 minutes left on the clock, Buriram had squandered a two-goal lead and found themselves on level terms with the lowly outfit when Túñez came forward for a set-piece that rebounded fortuitously off the bar and into his path. Immediately nodding the ball to his left, he found Patiño who instinctively hooked it in with a scissor-kick to give his team a 3-2 victory. Túñez was to become an integral part of the team, yet while he was brought in primarily to keep out goals, he soon found himself knocking them in at the other end as he made his physical advantages known to defences up and down the country. His first for the club came on 16 July in the home leg of the League Cup semi-final as his towering header, back-to-goal from Theeraton Bunmathan’s lofted free-kick, proved to be the winner against Ratchaburi. A fortnight later in the away leg, the Caraqueño colossus scored a near-identical goal past the same stranded goalkeeper as Buriram booked their place in October’s final with a 2-1 win on the night (3-1 on aggregate). Between getting his name on the scoresheet in these two games, he also opened his account in the league on 23 July with the opening goal – another header, three in five games for this period – in an emphatic 5-0 thrashing of Chiangrai. This win propelled Buriram to top spot for the first time in the campaign and, coupled with Túñez’s role in earning his side a place in the League Cup final, it was not surprising to learn that the fans had taken to him, though the manner in which they expressed their admiration certainly was. Indeed, in early August the Spanish sports daily Marca, curious of Túñez’s Thai deeds, published an article proclaiming him to be a local sensation who had been bestowed the affectionate moniker ‘El Gladiador‘, with sales to fans of replica masks similar to the one he was then wearing numbering 5,233. The Venezuelan sports media, who track the progress of their overseas internationals with varying degrees of commitment depending on the player, gleefully reprinted this story and consequently this perception of Túñez was to live on from afar long after he had been unmasked. Understandable perhaps, at least amongst Venezuelan fans, given that live access to games outside of Thailand is very limited and the majority of the player’s weekend matches kicked off when most of his compatriots would have still been in bed. For many with this idea of Túñez as some kind of omnipotent warrior who did the business at both ends while lording it over all and sundry, it was something of a reality check when, just 11 days after the article was published, nearest title rivals Chonburi ended Buriram’s 19-game (nine since Túñez’s arrival) undefeated streak in the league. A potentially lethal psychological blow was struck by Sutthinan Pukhom whose last-minute goal cut the gap between the two sides to just one point. Even after Chonburi dropped two points in their next game, thus allowing Buriram to increase their lead to three following a 2-0 win over minnows Air Force Central, the champions appeared to be on the ropes and were now facing a potential three-way battle for the title. This was because Buriram’s next game was an authentically epic encounter away to Muangthong United, the side who won the league on the three occasions in the previous six years that the Thunder Castles failed to. 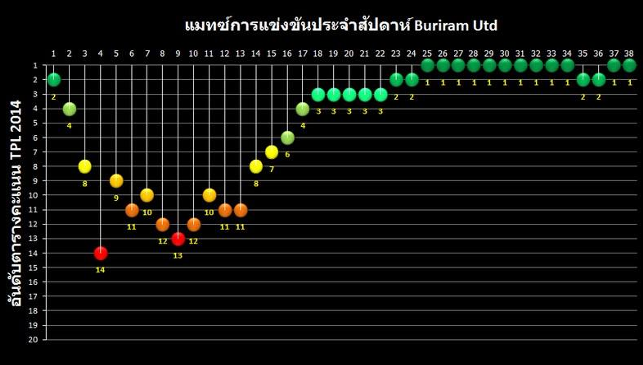 If another defeat could be inflicted on Buriram, they would find themselves level on points with Chonburi, with Muangthong United lurking just a solitary point behind the pair. Those who ascribed apotropaic qualities to Túñez’s mask were no doubt fearing the worst and scrambling for cover in their bunkers, as he was now no longer wearing it. A more tangible setback that befell Buriram in this period was the lengthy suspension served by Carmelo González that initially saw him banned indefinitely from late-July until the end of the season, but which was later successfully appealed to allow him to return in mid-October. Carmelo’s heinous double-offence was his response to seeing an elbow he received to his chin go unpunished: he first kicked a bottle in disgust that trickled too close to a match official for comfort and then, upon being awarded a second yellow card for his reaction, punted the ball upfield with all his pent-up rage, effectively telling the officials to go fetch. Thus, with no Carmelo, who had also been ruled out of the Chonburi loss, and the soft glow of Túñez’s aura threatening to diminish, Alexandre Gama’s Buriram went into this game acutely aware of the effects on team morale a second defeat against a rival could have. 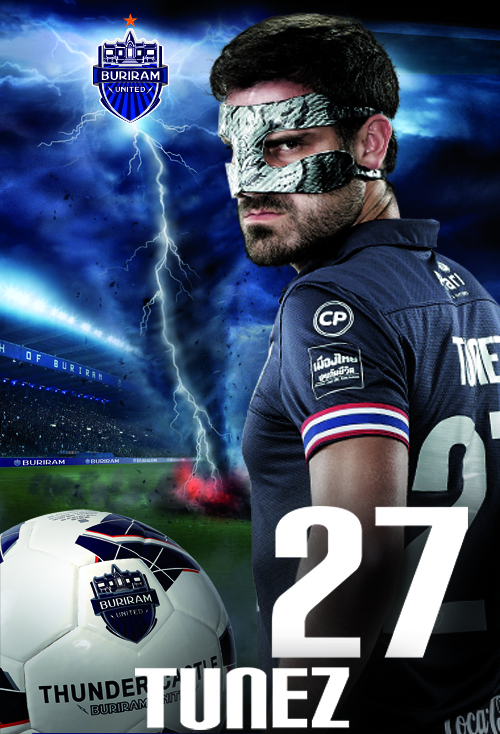 As it transpired, however, this match, which must rank as Túñez’s personal highlight of the campaign, is where he really cemented his place in the hearts of the Buriram faithful, scoring the winning goal with sensational, swashbuckling swagger, living up to every idealised projection of himself as he did so. It came 34 minutes into the first half following a corner that the ex-Celta man was back defending in his own six-yard box. As the ball was headed clear he could see that Muangthong had over-committed and, scenting an opportunity, he strode forward up the centre of the pitch, keeping pace with Jakkraphan Kaewprom’s run up the right flank. With just one defender between them, the ball was squared across the area for the patient Túñez to calmly slot home with a left-footed strike that, aside from some mandatory squeals, silenced the home crowd. That the Venezuelan was in such an advanced position was less of a surprise than witnessing him score with his feet, something he had never previously achieved at senior level (barring a perfectly legitimate golazo in Celta’s relegation run-in that was incorrectly ruled out and which led to the linesman being banned for his following game). The rest of the match was far from an inevitable march towards victory for Buriram as they conceded a penalty shortly after the goal that was gratefully saved by Siwarak Tedsungnoen and then had to play the final 30 minutes with ten men following Theeraton Bunmathan’s dismissal. Shots subsequently rained down on Tedsungnoen’s goal but Túñez and his defensive colleagues held on, achieving a euphoric victory of considerable significance that effectively knocked their hosts out of the title race. Unfortunately for fans of simple narratives, the Thunder Castles were unable to allow their supporters to breathe easily for too long, taking a leaf out of Chonburi’s book by following up their big result with a 1-1 draw against mid-table opposition, in this case Army United. This left Chonburi trailing by a mere point at the end of August, at which time all of the sides in the Thai Premier League packed up to make way for the Asian Games, whiling away the subsequent seven weeks with some friendlies until the final six games re-commenced in mid-October. Three days before Buriram could continue their league pursuit, a domestic double of sorts was still very much in the offing as they contested the Toyota League Cup final on 12 October with BEC Tero Sasana, who at this point had replaced Muangthong in 3rd. Given his leading role in both legs of the semi-final, Túñez could have been forgiven if he allowed himself to feel a sense of destiny about this match. However, in what was a very drab encounter low on opportunities and which featured a Mexican wave too many (one), it was instead the side with a barking Avram Grant on the touchline – serving his role as technical director – that ran out surprise 2-0 winners with two late goals. Thus, one trophy meekly slipped from Buriram’s grasp, but could two? The cup loss seemed no more than a momentary blip when the Thunder Castles resumed their league campaign with a victory against Sisaket that, as it coincided with a Chonburi defeat, put them four points clear with just five games left. However, the fatalists felt they were onto something after all when Buriram took just one point from their subsequent two games and Chonburi finally dislodged them from top spot for the first time since July. Buriram appeared to have blown it. However, after matching each others’ results in the next round of games, Chonburi committed the fatal, decisive misstep, drawing at the penultimate stage with Chainhat Hornbill in a game marred by immense controversy and which led to lengthy bans for the referee and one of the linesmen. Consequently, justly or otherwise, this allowed Buriram to be in control of their own destiny as they took a one-point lead into the last day of the season. When Sunday 2 November 2014 arrived, Chonburi’s slim hopes were quickly dashed after just ten minutes when Carmelo put Buriram 1-0 up against relegation-threatened Police United and Rochela was to make it 2-0 from the penalty spot with 25 minutes remaining. Although their opponents – now playing with ten men – managed to get a goal back a few minutes later, the Thunder Castles comfortably saw out the win, with Chonburi failing to even adequately fulfil their duty as the day’s potential scourge, drawing 1-1 with TOT SC. 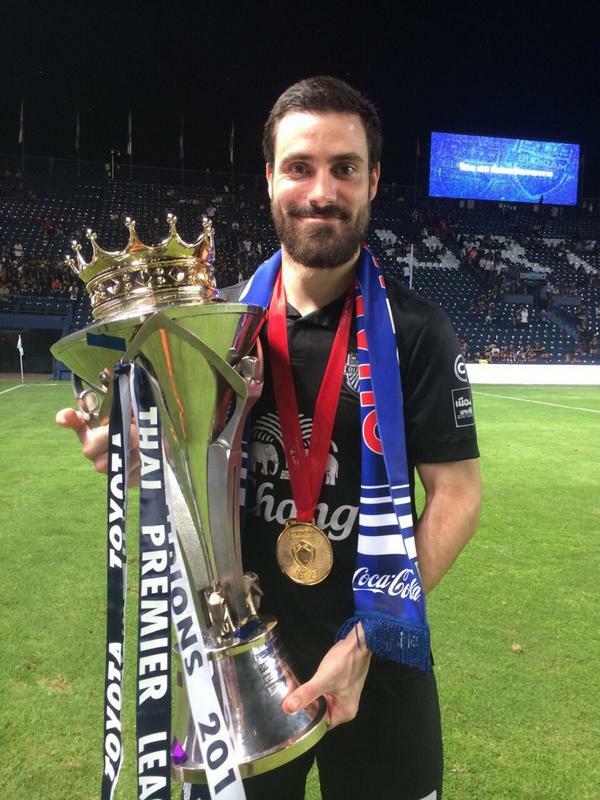 Buriram United were once again champions for the fourth time in their history and, for the first time in his professional career, Andrés Túñez had a league-winner’s medal. As can be observed from the official club videos of the game and the post-game celebrations (the goals soundtracked, as always, to a questionable rendition of the Village People’s ‘Go West’) as well as a players’ dance-off on the podium, there can be no doubt that this achievement was felt wholeheartedly by El Gladiador. Thus ended an unconventional yet exhilarating campaign for a revitalised individual who captured the hearts and imaginations of thousands of fans, not just of his own side, but throughout Thailand and beyond. While a cold reading of the above graph could pull Túñez’s perceived contribution to the championship success down a peg or two, it should do little to diminish his iconic status and role as one of his team’s most valuable players. It is nevertheless helpful to briefly consider the data in question to at least gain a slightly broader picture of Buriram’s season than has been reported elsewhere, without detracting from the part played by Túñez. Regarding the resurrection of Buriram’s campaign following their poor start, though the influential Marca article correctly stated that the club were in mid-table when Túñez was signed in late April (which would have been round 10, when they were 12th), it casually overstated his role in the reversal of their fortunes. Indeed, despite providing his appearance statistics which should have given more pause for thought, the article neglected to mention that he did not make his debut in the league until round 20 of the season, by which time Buriram had climbed to 3rd. Thus, as the club were already on an upward trajectory huge credit is due, first to the interim coach Božidar Bandović and also to his permanent replacement Alexandre Gama, who continued his predecessor’s work of motivating the undoubtedly talented players to reach their collective potential. That is not to imply that Túñez was a minor player in his side’s initial rise to the summit in late July (round 25) – shortly before the article was written – as unquestionably, throughout his early match-winning performances, he was anything but. As has also been relayed, he would go on to play a crucial role in maintaining (albeit with a minor slip or two) their position until the end of the campaign but, along with the contributions of some of his team-mates noted earlier, Gama’s role should also be emphasised. Indeed, looking to the future, Túñez must have been delighted to hear that the Brazilian coach has recently signed a new contract, as the Venezuelan said he was initially attracted to Buriram as they tend to qualify for the AFC Champions League – a competition in which his boss has some pedigree. Back in 2007, Gama managed to take Al-Wahda of the United Arab Emirates to the semi-finals of the competition – the club’s best ever performance – and will surely relish next year’s opportunity to improve upon Buriram’s limp showing under Menéndez earlier this season. Although the recent news that Carmelo González will be leaving the club must cause some pause for thought, it is likely that Túñez will still be around to play in this continental competition as he initially signed on a three-year deal and has indicated that his mind is very much on staying with Buriram. Ultimately however, whatever happens in his future and wherever he next finds himself playing, he will always fondly recall, and be fondly recalled for, this league-winning campaign with Buriram United. Many players have seen their careers dissolve into insignificance after being told they are surplus to requirements at the only professional club they have known but this Galician’s response has been exemplary. Conversely, many players have left the club of their youth and gone on to win titles, often in more prestigious leagues. However, very few can claim to have had the revelatory season enjoyed by Túñez and become a cult hero to football fans in at least three continents in the process. So, whether they were cheering on El Gladiador in Thailand, Venezuela, Spain or possibly even Israel and regardless of how much match footage they managed to see, those who were in any way privy to this story know that it was one well worth telling. This entry was posted in Venezuelans Abroad and tagged Alejandro Menéndez, Alexandre Gama, Andres Túñez, Asia, Avram Grant, สโมสรฟุตบอลบุรีรัมย์ ยูไนเต็ด, ไทย พรีเมียร์ ลีก, Balaídos, Božidar Bandović, Buriram, Buriram United, Carmelo González, Celta de Vigo, Celta Vigo, Chonburi, Copa de la Liga de Tailandia, Cult hero, David Rochela, Football, Galicia, Javier Patiño, Jay Simpson, La Liga, Liga BBVA, Liga Premier de Tailandia, Luis Enrique, Newin Chidchob, Os Celestes, Paco Herrera, Primera División de España, Spain, Thai Premier League, Thailand, Thunder Castle, Thunder Castles, Toyota League Cup, VenEx, Venezolanos en el exterior, Venezuela, Venezuelans Abroad, Vinotinto on November 6, 2014 by hispanospherical.